Planning routes for The Art of Running is not an easy task. As I’ve said before, you can’t just impose a picture on a city. You have have to kind of unfocus, go cross-eyed, zoom out to to at least a kilometre above the city see what the roads and railway lines suggest. 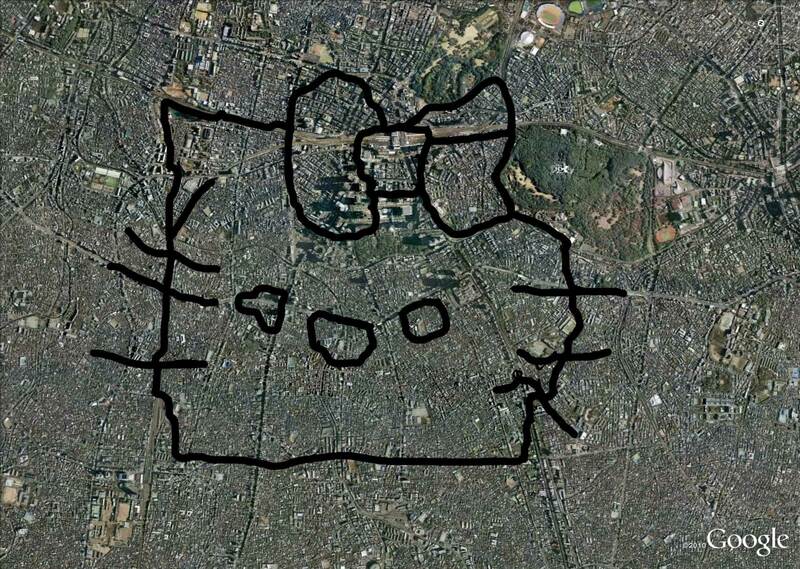 So it was that late one November night, Shinjuku-ku offered up Hello Kitty. I tried to ignore it at first. Not because I disliked Hello Kitty or anything like that …no, it was the length of her lines. An initial outline traced with Google Maps suggested that this would require me to run something like 35 kilometres – not an attractive prospect for someone who usually hits a wall at about half that distance. So, I put her to one side, told myself I’d need some time to prepare before attempting to trace her feline face. Fast forward two months. 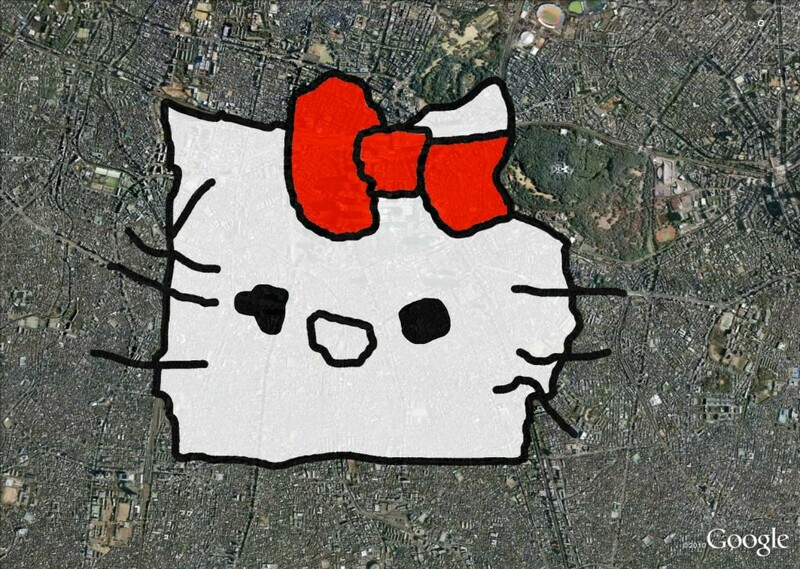 I’m giving a presentation to a local residents organisation about my use of tech and how it plays an important role in my life in Japan, and in the heat of the moment tell my audience that within a week I’ll draw a picture Hello Kitty in Shinjuku. Well, that was it. No way out. I had to do it. I was also filled with fear by the prospect of creating those 6 whiskers: they were going to require me to double back on myself no less than 12 times, something I generally try to avoid.The planning for this run ended up taking over 3 hours. With such a large area being covered I had multiple railway lines and highways to negotiate. These had to be planned at a minute level, zoomed right in with Google maps, trying to figure out if there were footpaths where the roads didn’t go. By Wednesday night I knew I couldn’t avoid it any more, and so planned my early departure for the following morning. 3 iPhones and a wifi router were put on to charge, 6 running tops strategically placed on the rail by the heater that would switch on a little before I had to wake up. Thursday was a typical Tokyo winter’s day – beautiful blue skies, but friggin freezing! 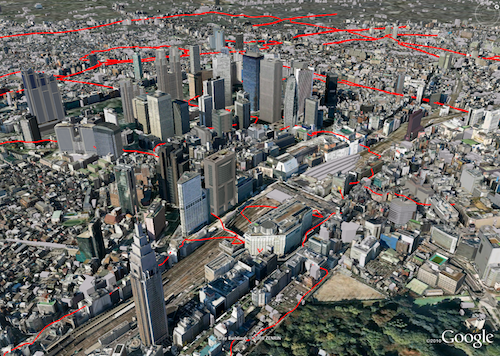 Nonetheless, I was in Shinjuku by 8am, and after stretching in the warmth of the station, set off in an anti-clockwise direction to create the main outline. The planning paid off, and with careful constant attention to the iPhone showing my route, I rarely found myself faced with a deadend or uncrossable road. 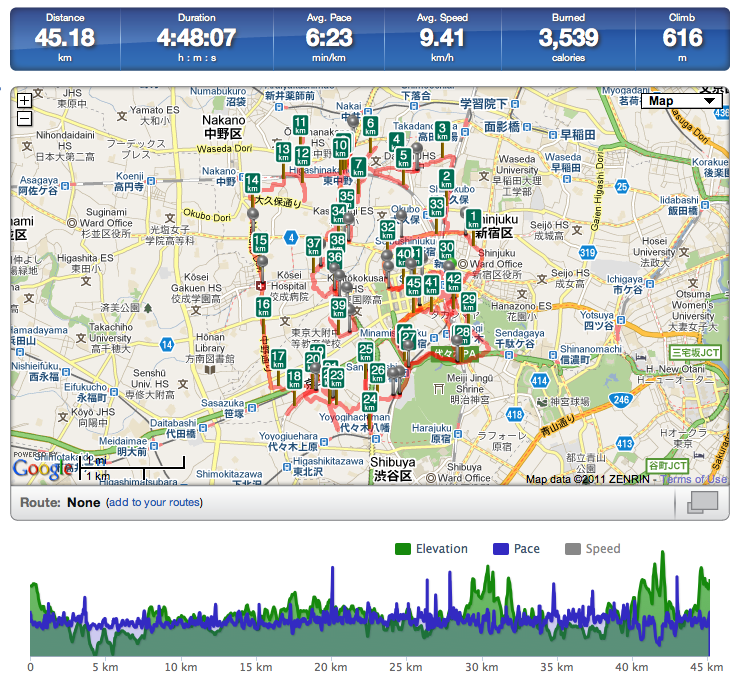 (Route / Stats recorded by Runkeeper). It was interesting coming across places I’d only ever known in relation to other stations – the DIY centre in Nakano, the new subway station, that was being built further west, the Microsoft and NTT Docomo skyscrapers. Despite the cold I sweated pretty heavily, getting through 2 litres of fluid, an ice cream and a chocolate muffin during the run. I must admit, I’m very pleased with the results. The only thing that I wish I could have improved on was the right-hand side of the bow, which is slightly crumpled in due to my not being able to go through the private park. Still, that aside, I’m delighted that I was actually able to run so far without collapsing, and also that I made such a quick recovery. It bodes well for the Tokyo Marathon on February 27th. Thats so awesome.. never would have occurred to me to try such a cool thing.. but now looking at designs I could try! Bravo!! Thanks! Be sure to share with us any artistic runs you do! What a great try, Joseph! This is a collaboration of art and sports!! I am looking forward to seeing you in Tokyo marathon. Thanks for your comment. Yes, I switched off GPS between bits. I use one iphone to track w/ runkeeper, one iphone for google earth showing route to follow, one iphone for twitter to reply to people guessing what I’m running! Reading about your run then finding these maps was really neat. I love the idea of making pictures with the GPS and imagine it’s a lot of fun too. I’m having a lot of fun trying to run on every single street in my hometown of Franklin, WI USA. It’s been a great way to keep running simply fun. http://bit.ly/pinkrunner has the latest coverage. Thanks! Wow, your project is pretty intense! excellent stuff.